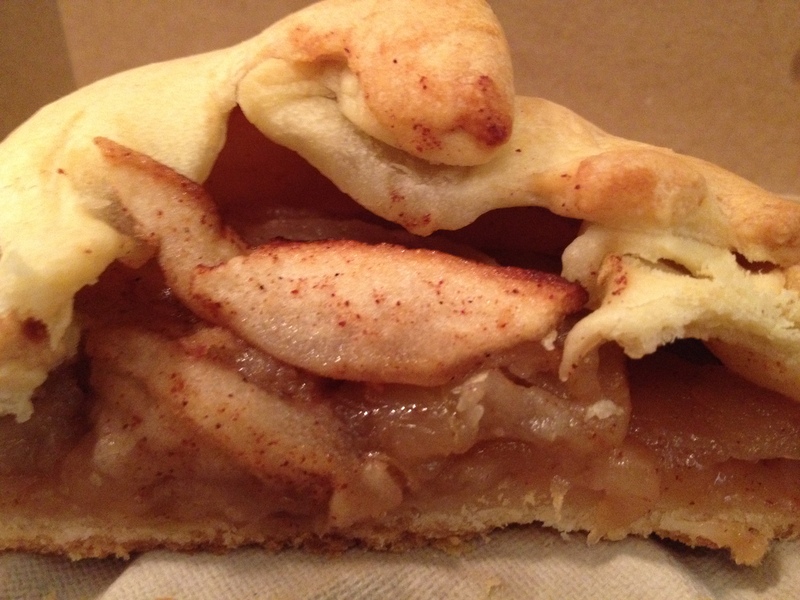 An apple galette is like an open-faced apple pie. 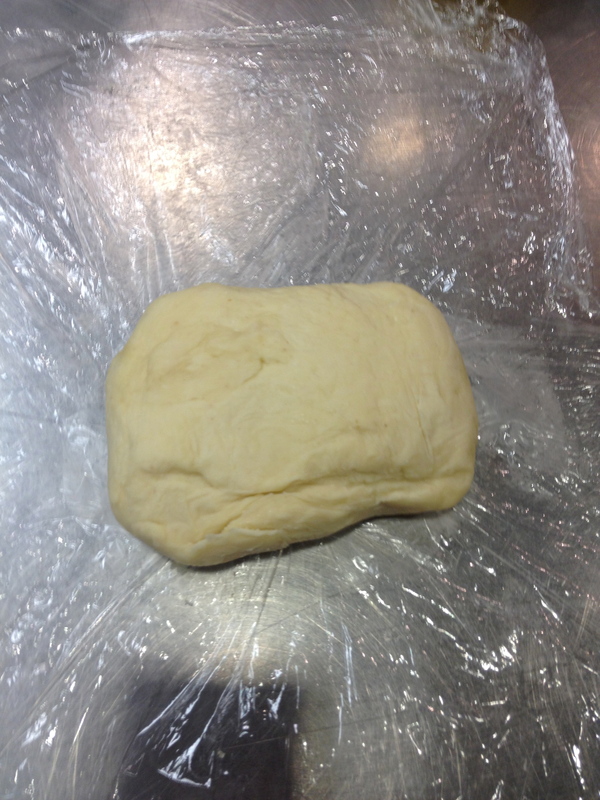 It began with making the milk pastry using pastry flour, butter, salt and milk. 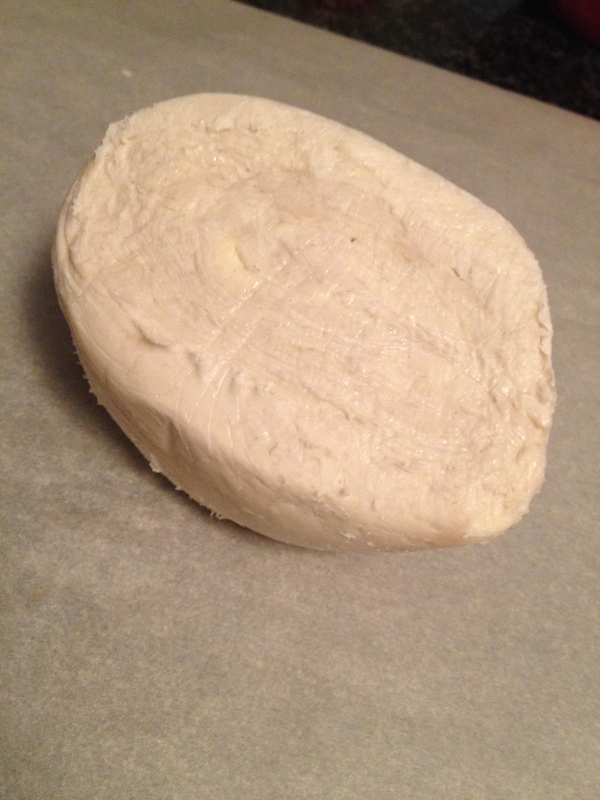 We used a mixer and dough hook to make the dough, which once mixed was then divided and chilled. 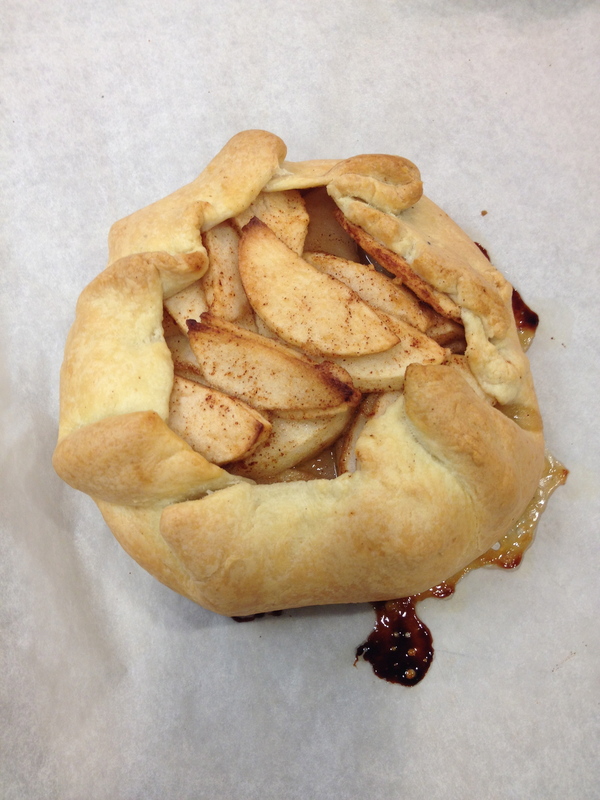 While the dough chilled, the apple filling was prepped. 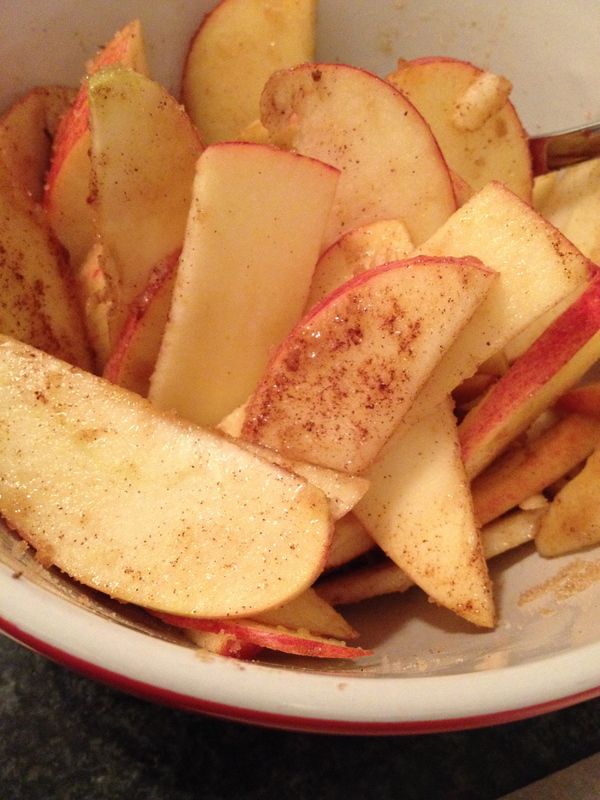 Peeled and sliced, the apples were mixed with brown sugar, cinnamon and some lemon juice. 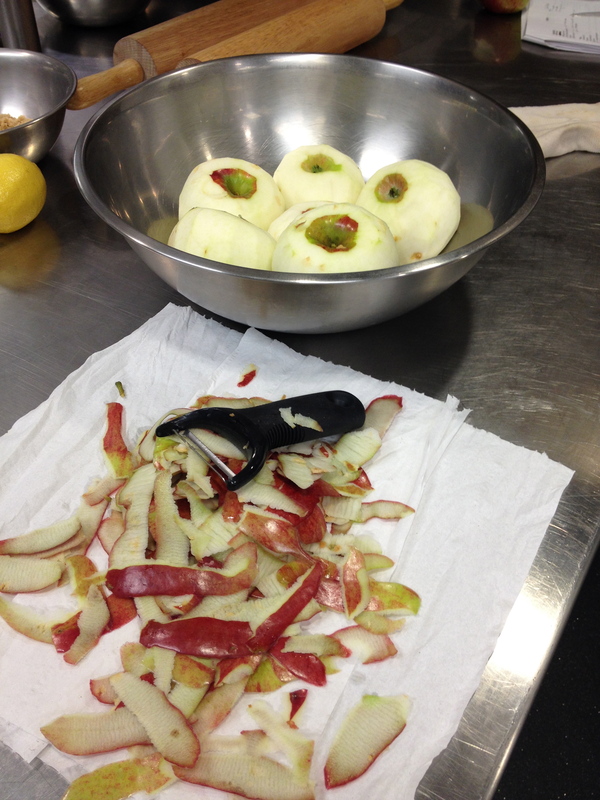 The chilled dough was then rolled out to a flat round so that it could be filled with apples. 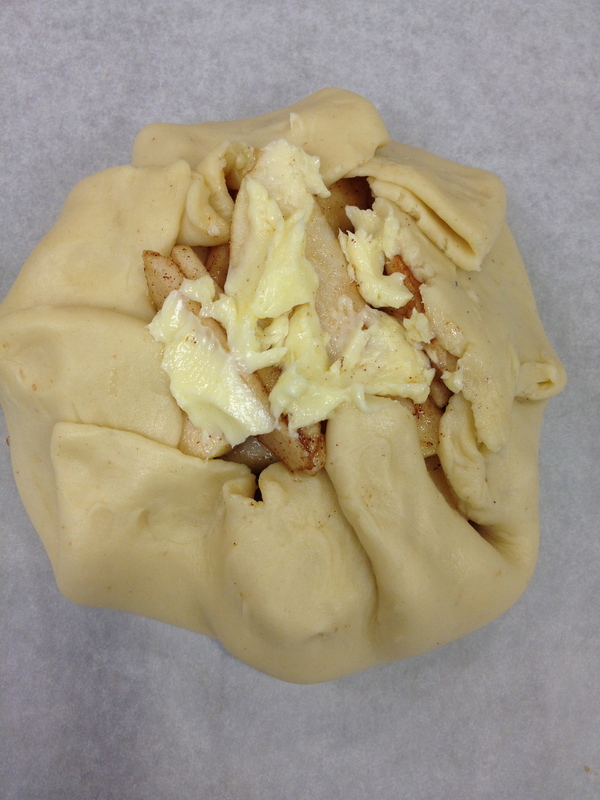 The edges of the pastry folded in decoratively. 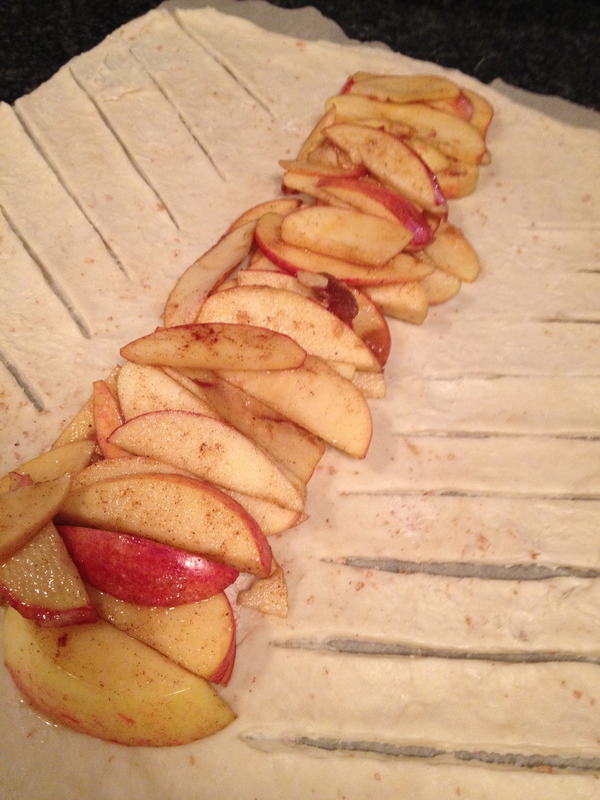 The galettes were baked for about 40 minutes until golden and the apples stopped bubbling. I was so excited to try this when I got home. 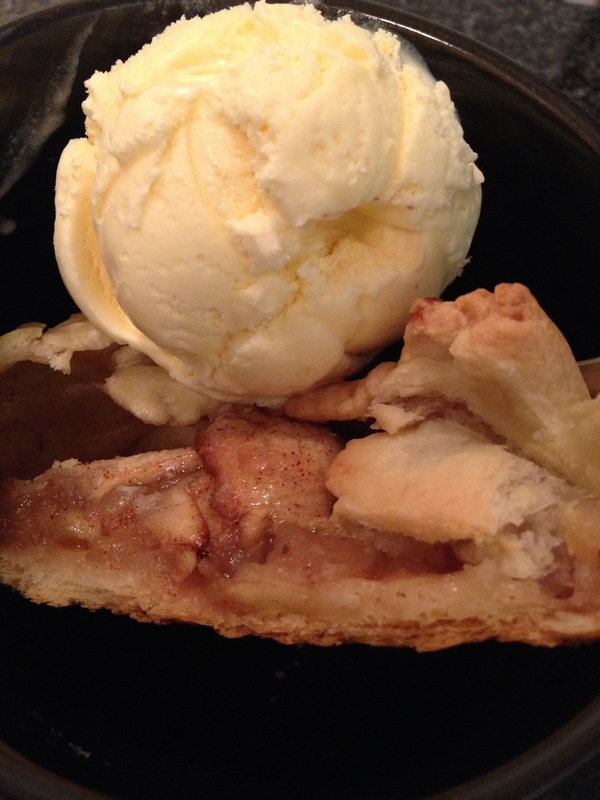 I just wanted to eat it warm with vanilla ice cream. 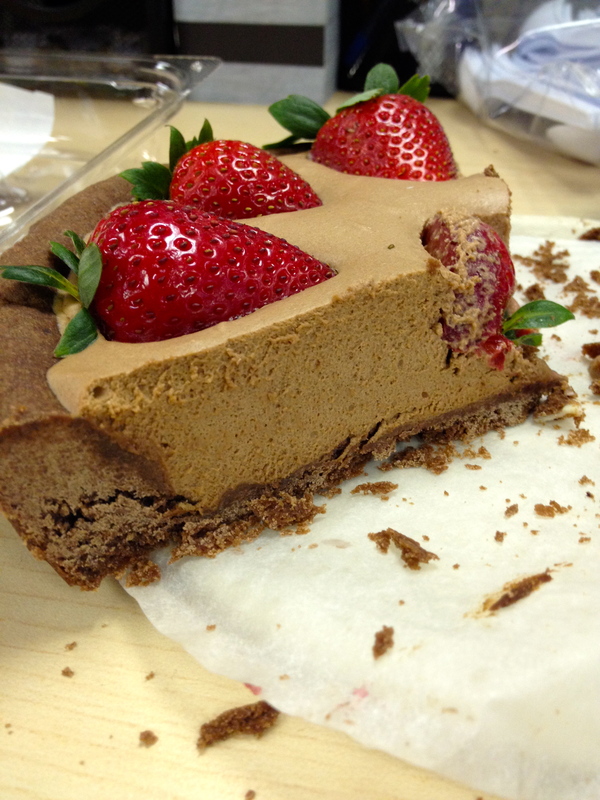 This class, we made some decadent chocolate tarts – a chocolate mouse tart and a bittersweet chocolate truffle flan. I forgot my phone this day, so no step by step shots but I hope these few after shots do enough to capture how delicious these two pastries were. 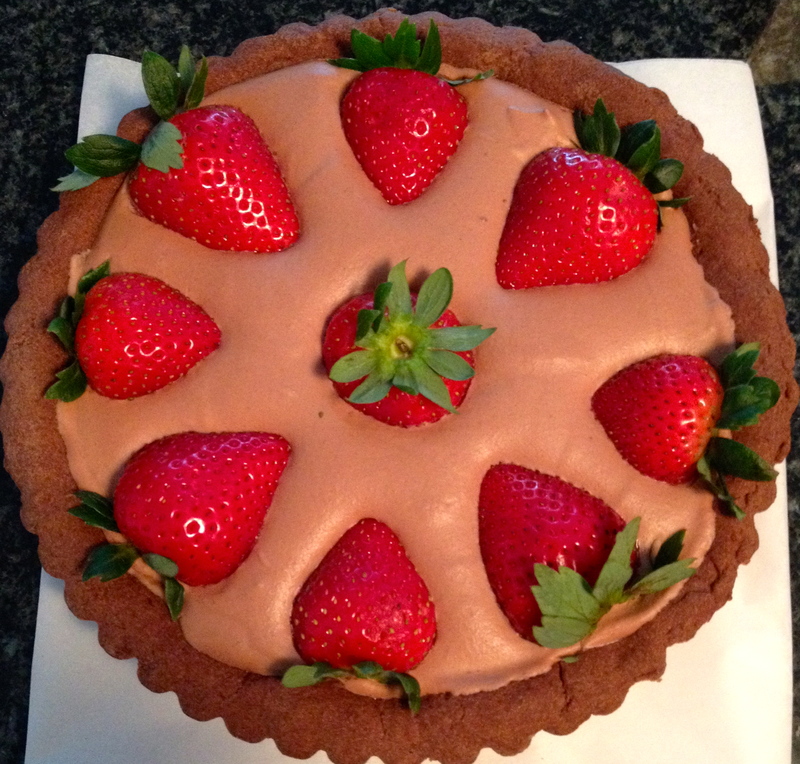 This is the chocolate mousse tart, strawberry accents. 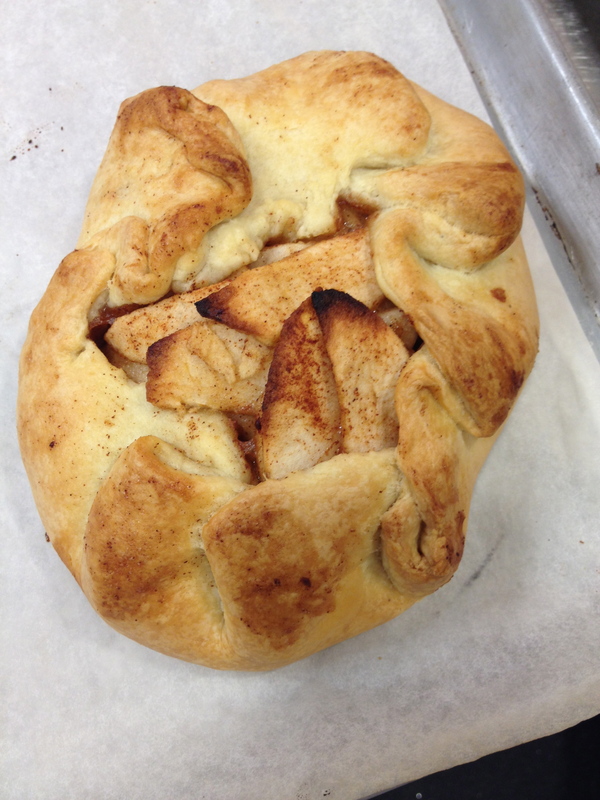 The crust was similar to a cookie dough and was made with butter, sugar, eggs, flour, and cocoa. 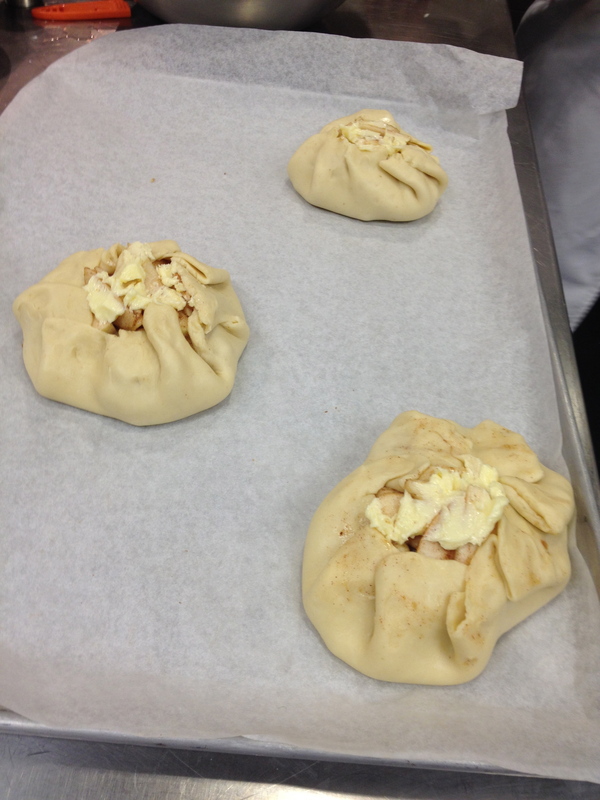 We pressed the dough into a tart pan and baked it using foil and beans to weigh it down and keep it from bubbling. The mousse was made with bittersweet chocolate, simple syrup, gelatin and whipped cream. 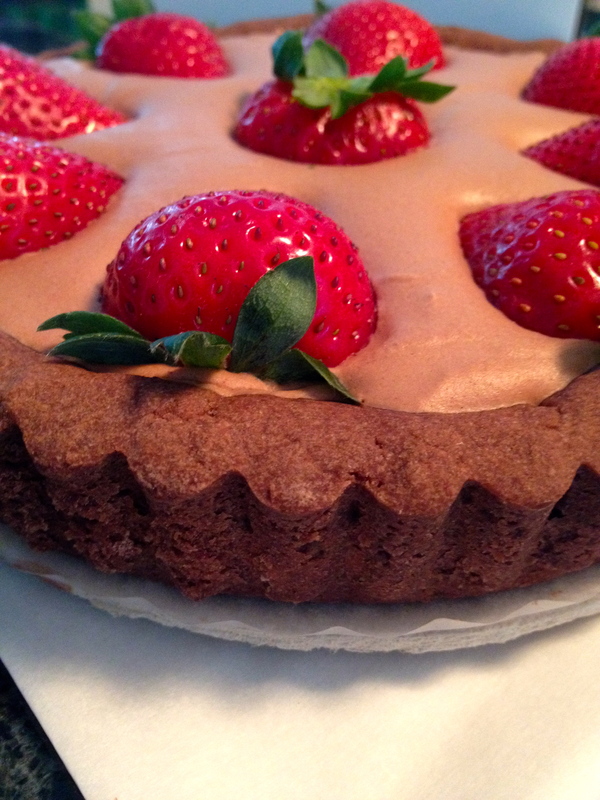 The mousse was then spooned into the cooled crust and the strawberries added on top. 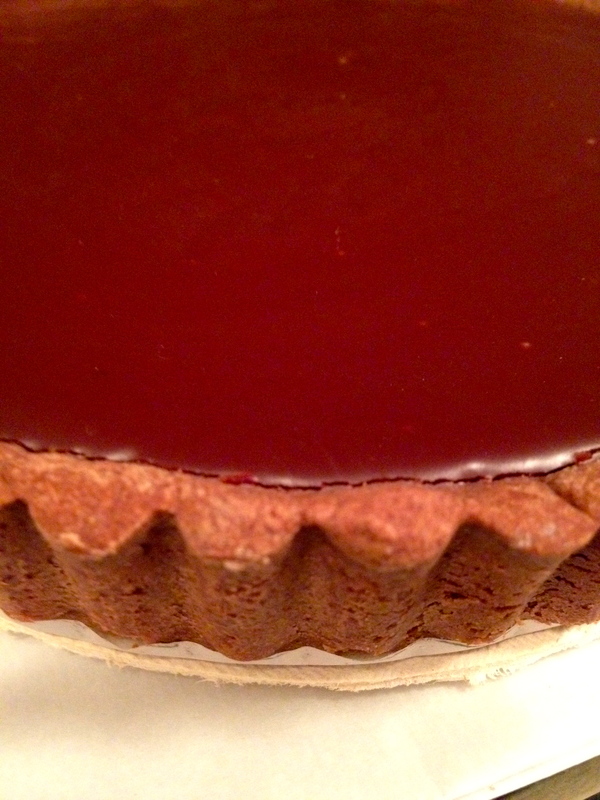 The tart was then chilled to allow the mousse to firm up. 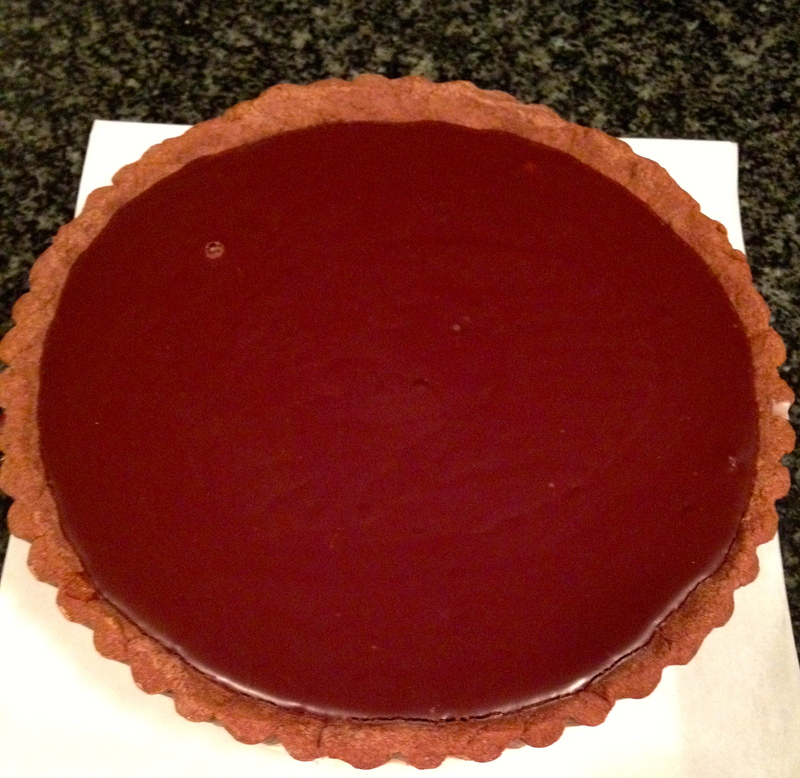 This is the bittersweet chocolate truffle flan. 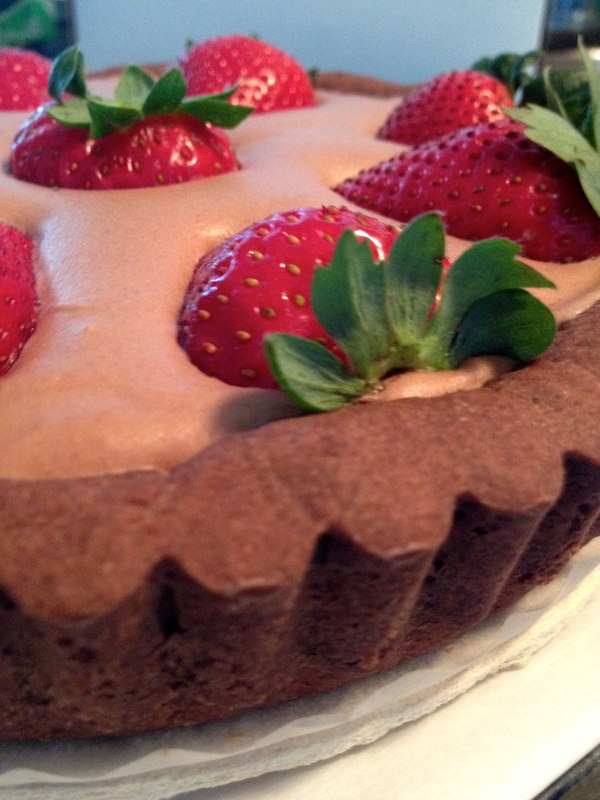 The crust was the same recipe used in the mousse tart. The filling was the easiest recipe involving only two ingredients – whipping cream and bittersweet chocolate. We made a ganache but simply heating the whipping cream until slightly boiled and then pouring over the chocolate which had been broken down in to smaller pieces. No stirring for a few minutes to allow the chocolate to be heated by the cream and melt. 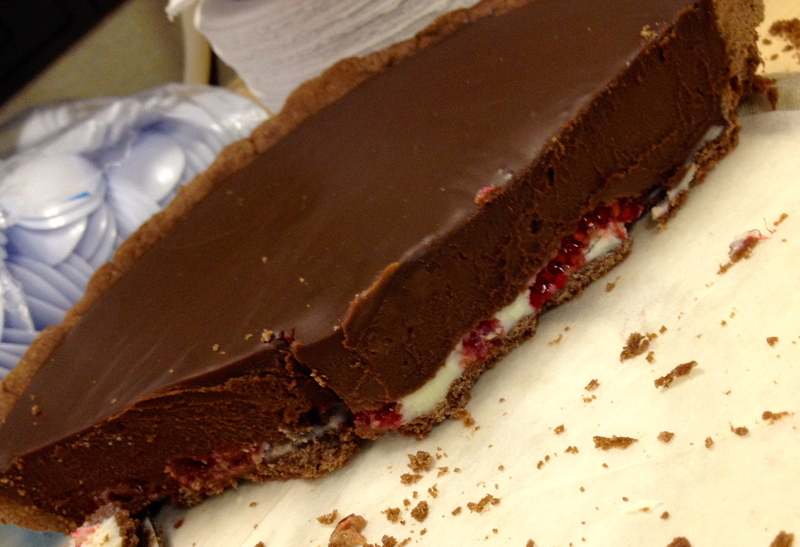 Before pouring in the ganache, I poured a layer of melted chocolate on the bottom of the chocolate tart shell and some raspberries. A nice little surprise that is seen once the tart is sliced. Back to baking class! 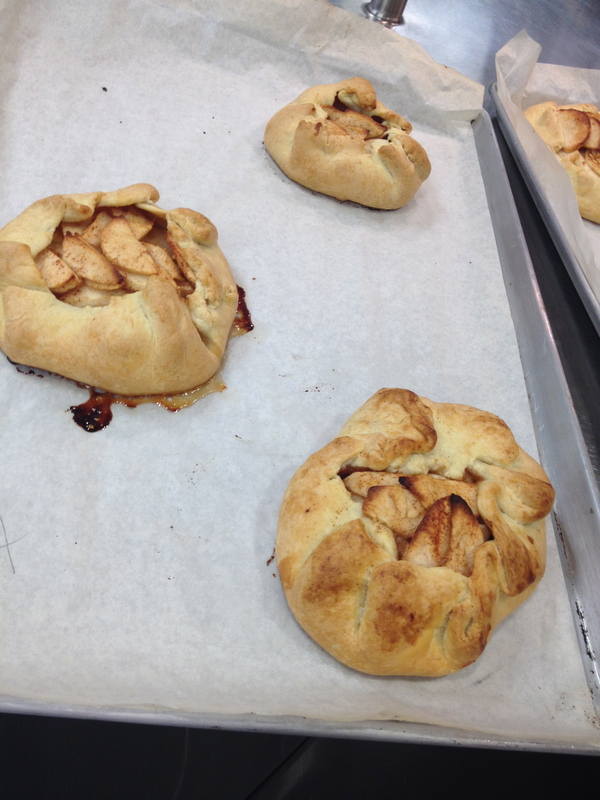 This time I am enrolled in Pastry and my first class we put together some puff pastry to be used in later classes. 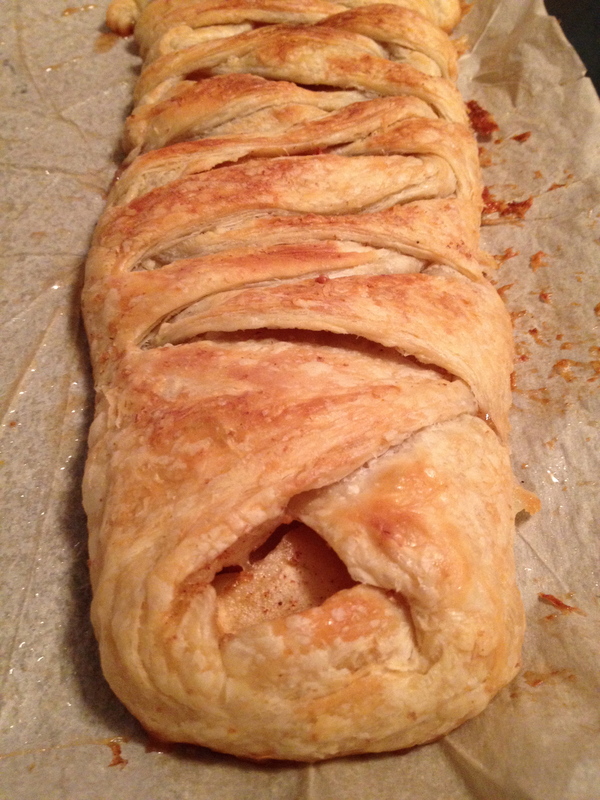 I missed my second class for a prior engagement, but I took my puff pastry home to try my hand at apple strudel on my own. Here goes. 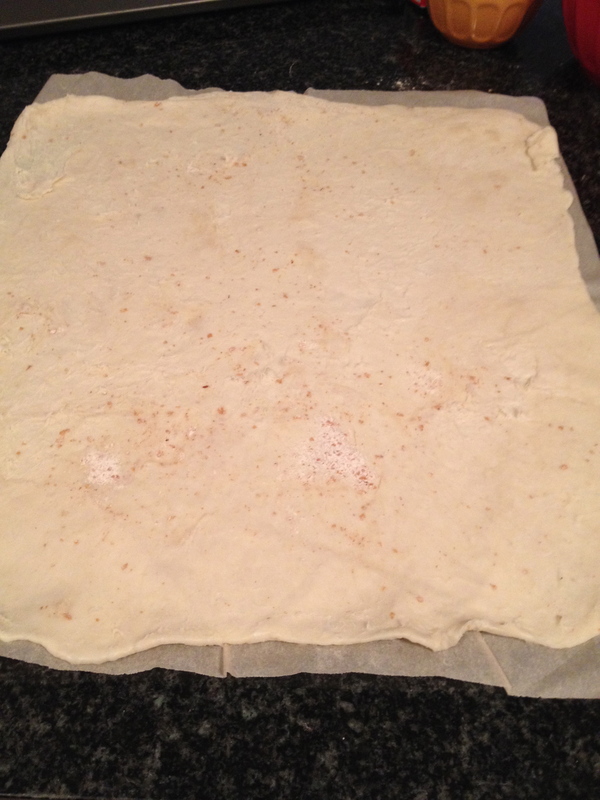 It begins by rolling out my pastry dough into a fairly thin rectangle of sorts. Then I cut some diagonal slits along the sides. 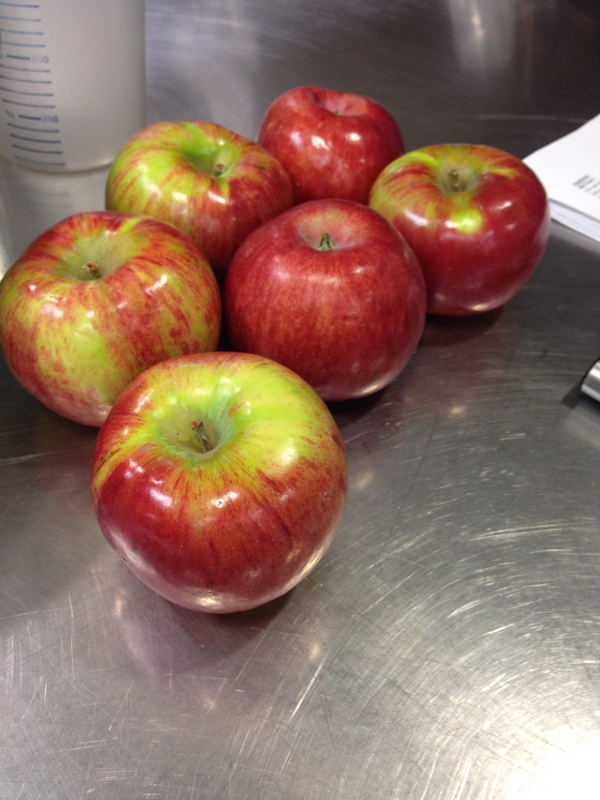 These will be used to cross over and cover the apple filling. A very simple filling. I just sliced 2 apples, added some pumpkin spice and brown sugar. 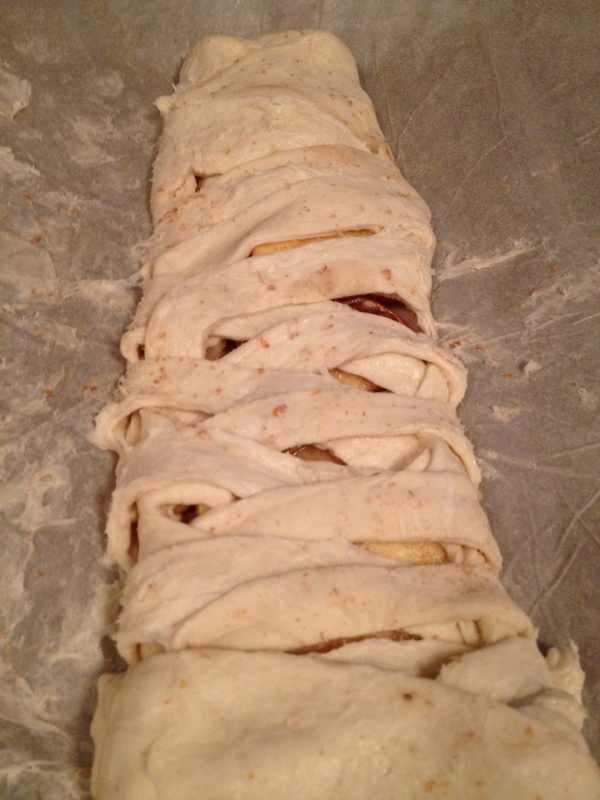 Then layered the apple filling down the middle of the dough. 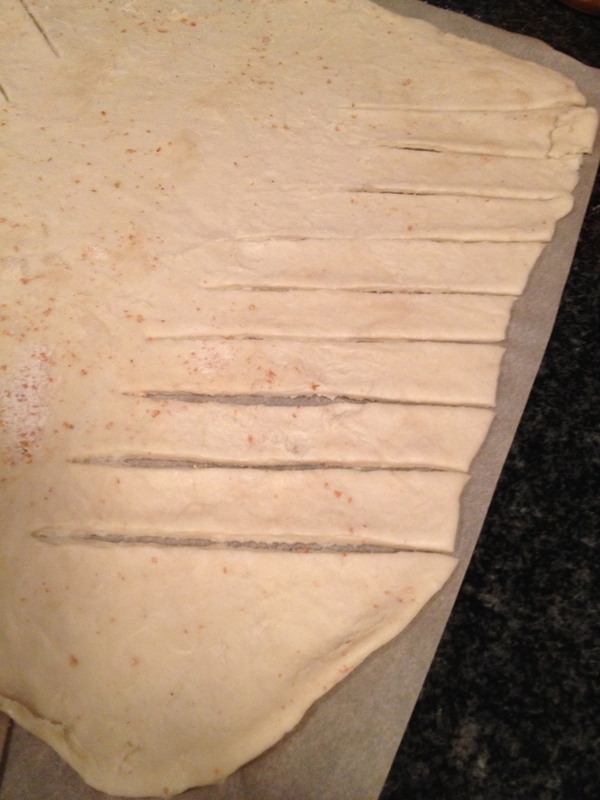 Crossed over the strips of dough. Then into the oven to bake for about 40 minutes, until the dough became golden. I made the mistake of forgetting the egg wash, so my dough was a little pale. But next time, I’ll remember better.